Every morning, students in the sprawling San Juan School District in Utah place their right hands over their hearts and recite a pledge. Despite two centuries of reasons not to honor the American flag, none of the students -- nearly all Native American -- have ever opted out. And they all recite the words in Navajo: "To the Sacredness of Our Flag. From the land of the 50 United States of America. We pledge our allegiance to God and our flag. It stands for hope and compassion. We stand united as People of all cultures on our beloved land. We are preserved by the power of peace and harmony." It is a moment of patriotism, aspiration and deep respect for the land -- all spoken in a language that existed well before our country did. 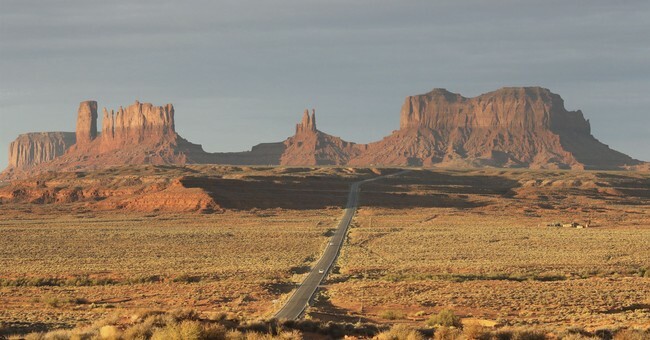 "We translated (the Pledge of Allegiance), and now we say it for the United States flag, and also for the Navajo Nation flag," said Clayton Long, the bilingual education director for this sprawling school district, located partially within the Navajo Nation reservation. The daily recital is part of Long's efforts for over a quarter of a century to revive his Native American language. Amazingly, many Native American children grow up not knowing how to speak their tribal language. Now 65, Long was raised in a home that only spoke Navajo, which inspired him to make teaching the language his life's calling. He said: "My work has always been aimed at our young people. They are the ones who hold the key to the preservation of our language and other parts of our culture." The San Juan School District is made up of over 3,000 students, over half of whom are Navajo, while the rest of the students are Ute, Hispanic, white or other races. Interestingly, it was modern technology that allowed Long to double down on his efforts to teach an ancient language, not just to the kids in his school district but anyone beyond its limits. This summer, developers at the popular language app Duolingo spotted Long's YouTube channel on Navajo lessons. A representative from Duolingo contacted Long and asked if he could adapt his courses for their app. Long agreed and is now using the app to teach his own kids. Because the program prompts students to translate phrases from English into Navajo using familiar technology, it puts the language lessons in the hands of the students. At the same time, students are helping develop the lessons, which are now available to Duolingo's 300 million users. "This collaboration is a dream come true because it reaches young people, it makes them the leaders, but it also exposes the world to our language and our stories in a way I could have never accomplished," Long said. "Duolingo, which began seven years ago as a Spanish-English app, now has over 90 language courses, and Navajo is the first Native American tongue to be picked as part of their program," said app representative Mara Awodey. Guatemalan-born computer scientist Luis von Ahn launched the Pittsburgh-based Duolingo after he sold his second high-tech company to Google, which placed him in a pretty fortunate position. "I basically wouldn't have to work anymore. What I wanted to do was something related to my passion, which has always been education and language," he said. It's a passion deeply appreciated by the educators in the San Juan School District. "Those who spoke the language in the mid-19th century were forced into speaking English by the federal government," said Charlotta Lacey, who has taught Navajo under Long for three years. Now young people "are the leaders in the movement" to revitalize the language. Long is hoping to expand his program to more schools throughout the country. As far as he knows, just three other American schools -- all in Arizona -- teach Navajo to kids. "We have started to talk to other school districts within the Navajo reservation to involve other teachers and students in the development of other Duolingo mini-lessons," said Long. "Hopefully, I'm around long enough to see ... some more ideas that flow from this. I can see new songs, new dances ...," he said, his voice trembling with emotion. "All Americans are treasures, and when you treasure something, you want to preserve it. You want to make it last as long as possible. If the children can see that that's possible, we'll last for a long time."